The annual Amazon shareholder letter by Jeff Bezos, released on Thursday, discussed a metric which has been secret at Amazon since the marketplace launched in 2002. That metric is gross merchandise volume (GMV), the total amount of sales on Amazon websites including those by the company itself and by the sprawling marketplace. Historically the company only reported its sales and revenue from marketplace fees, but not actual sales on the Amazon marketplace. $160 billion is how much third-party sellers sold on Amazon in 2018. An estimated $30 billion more than they did in 2017. Amazon’s first-party sales amounted to $117 billion. For a total of $277 billion in gross merchandise volume. In a decade third-party sales have grown from 30% of the total to 58%. Thanks to the compound annual growth rate of 52% since 1999. In 1999 sellers on Amazon did $100 million in sales, in 2018 sellers on Amazon did $160 billion in sales. Third-party sellers paid Amazon $39.7 billion in fees last year, 24.8% of the $160 billion in third-party sales. Those fees include commissions and any related fulfillment and shipping fees, and other third-party seller services. However, they don’t include advertising spend which would raise the total fee amount above 30%. For comparison, eBay captured 9.6% of marketplace GMV as revenue last year ($8.6 billion in fees on $83.8 billion in third-party sales). Two hundred thousand small and medium-sized businesses eclipsed $100,000 in sales on Amazon in 2018; the number grew by 60,000 from 140,000 in 2017. It was just 70,000 in 2015. The growing number of sellers achieving this sales milestone is a direct result of the overall marketplace growth. Every year the marketplace gets larger, providing opportunities for both new sellers to enter the market, but also for existing sellers to expand. However, maybe unsurprisingly, the bigger the sales figure is, the slower that segment is growing. The number of third-party sellers with over $1 million in sales increased by only 4,000 - up to 24,000 - in 2018. Out of character, Jeff Bezos letter also referenced eBay’s GMV, as a benchmark to showcase Amazon marketplace’s growth, and asked the question “Why did independent sellers do so much better selling on Amazon than they did on eBay?” The company has never mentioned eBay or any other competitor before in any of its public announcements. 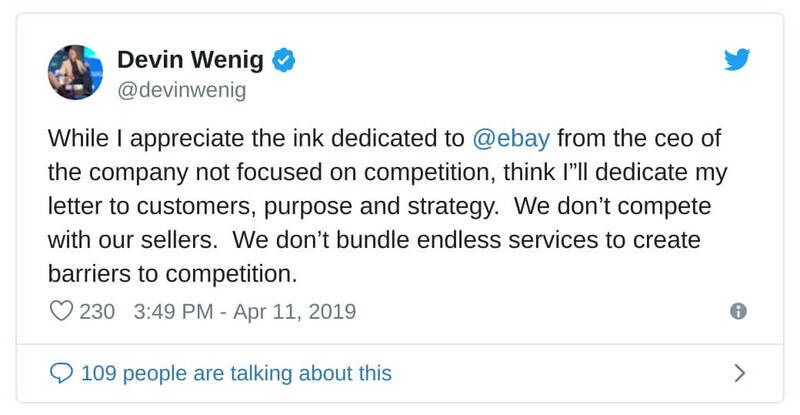 Devin Wenig, the eBay CEO, hit back. The “barriers to competition” is referring to anti-trust concerns surrounding Amazon, which Jeff Bezos annual letter was in part refuting.